Are you sure you want to remove Franz Kline, 1910-1962 from your list? Franz Kline 1910-1962: an exhibition of works on paper : March 29 - May 14, 1977. 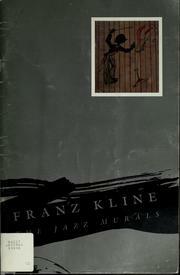 Franz Kline, 1910-1962: [catalogue of an exhibition held at] Marlborough-Gerson GalleryInc, March 1967.